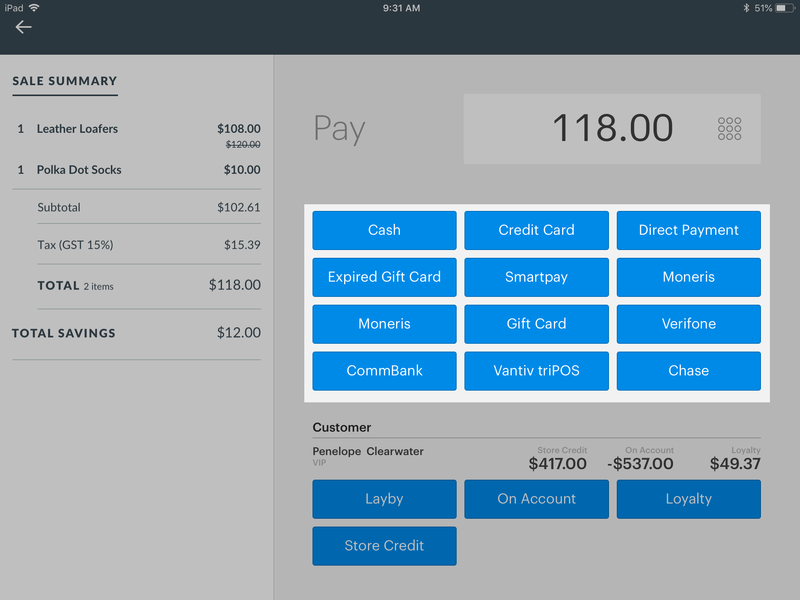 Using Vend for iPad – How can we help? Enhancements to Vend on iPad. 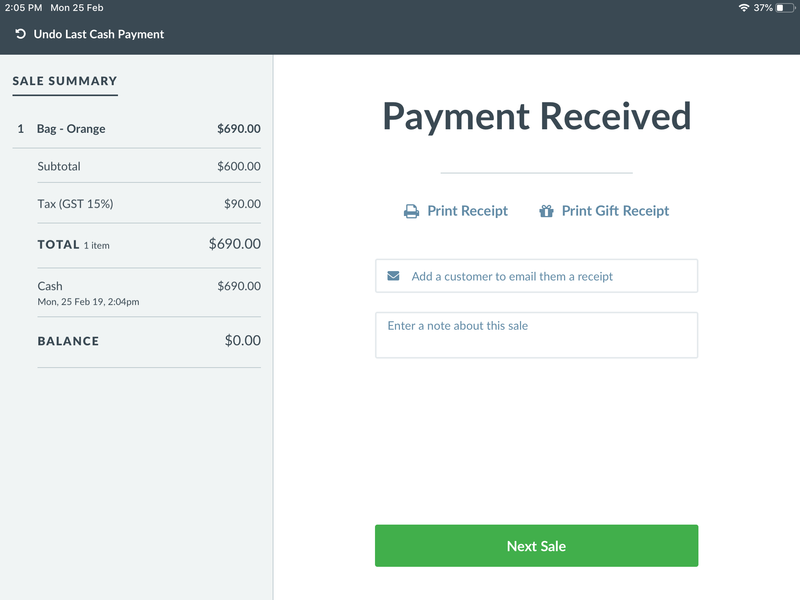 We’re making improvements to Vend on iPad to make checkout even faster for you and your customers. These improvements will be a part of the latest iOS version 3.1.3 update. We’ve made improvements to completing a sale and receipt templates. 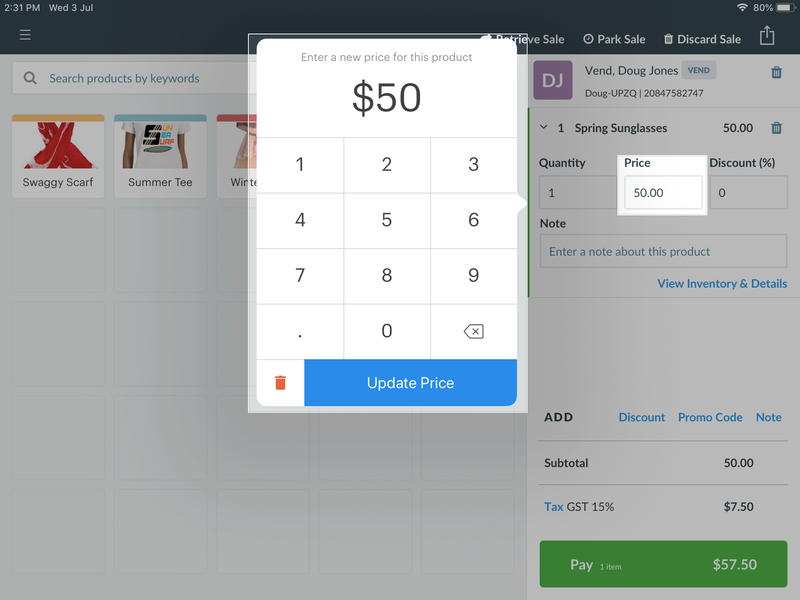 If you sell with Vend on Mac and PC too, you’ll already be very familiar with this layout. After completing a sale, you'll be able to see a full Sale Summary—you can also add a customer directly to your database when you email them a receipt, and add further notes after the sale. We have also made changes to the screen that display the type of sale you have processed and also your customer information. 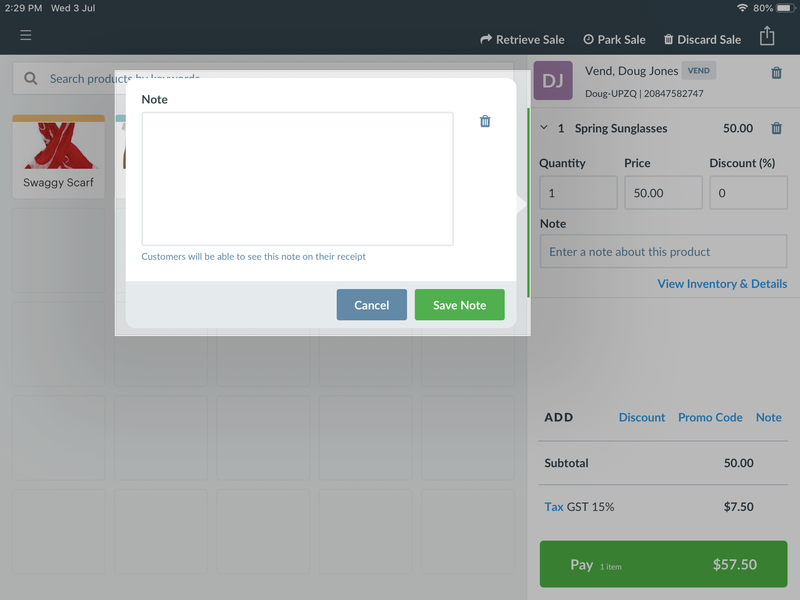 We’ve made improvements to receipt templates in Vend. You’ll enjoy a fresh new look template, simpler setup, the flexibility to add more details, and a more personalised experience for your customers. 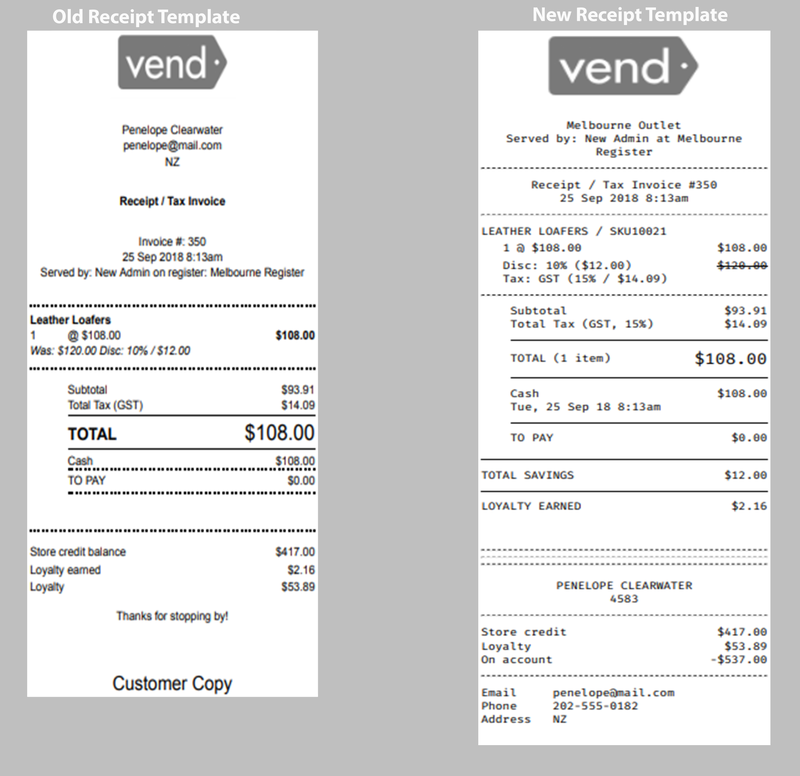 The new receipts are also more efficient to print, and are more durable too. For more information on our new receipt templates, click here. 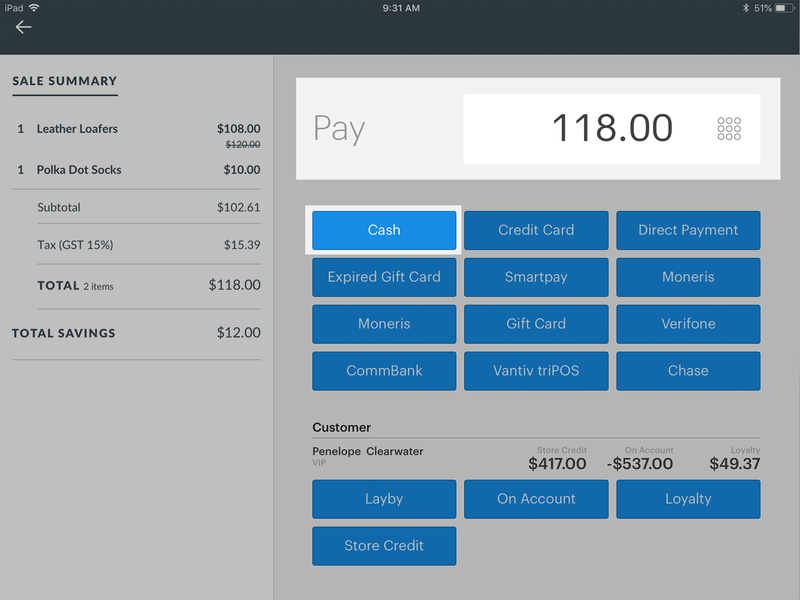 Vend for iPad is specially designed to be quick and easy for retailers to use. First, you will need to setup Vend on your iPad. To learn how to do this, check out this article. Once you have followed the steps detailed in this article, you will be all set up and ready to start making sales on your iPad. 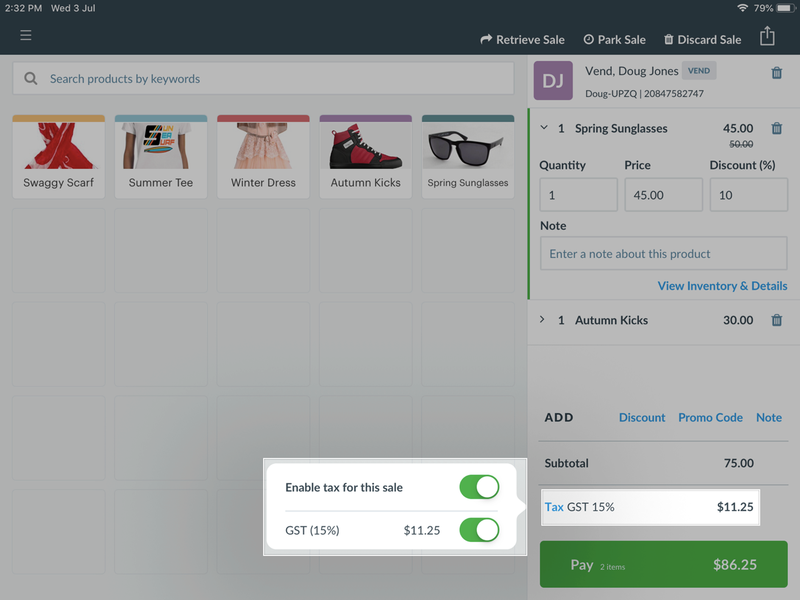 There are three ways to add a product to a sale with Vend for iPad. Clicking the magnifying glass and searching for the item. Click on the product quick key to add it to the sale. If the product has variants, you'll need to pick which version of the product you are adding. Once you have selected the product or product variant, it will be automatically added to the sale. Grab your barcode scanner and scan the customer's item(s). This will automatically add the item(s) to the sale. Product is not showing up when scanned? If a product you have scanned is not automatically adding to the Sell Screen, try and add it manually using the step below. To search for an item, tap into the search box to Search Products by Keywords. Type in the product's name, handle, brand, type and supplier code or SKU. There are also several ways you will be able to manage the items being sold. For example, adjusting product quantities, viewing information about the product, adding a note to the item, editing its price or removing the item from the sale entirely. Adjusting product quantities - If your customer wants to buy more than one of a certain item, you can increase the product quantity. To edit the quantity, tap the item in the 'sale' panel. This will allow you to edit it. Tap the Quantity option, and a popup will open. This will enable you to either type or use the + sign, to change the quantity. Press and hold the product Quick Key on the Sell Screen. Press and hold the search results from the product search bar. Press and hold over items added to the sale. Stock level (including each variant) for each outlet. 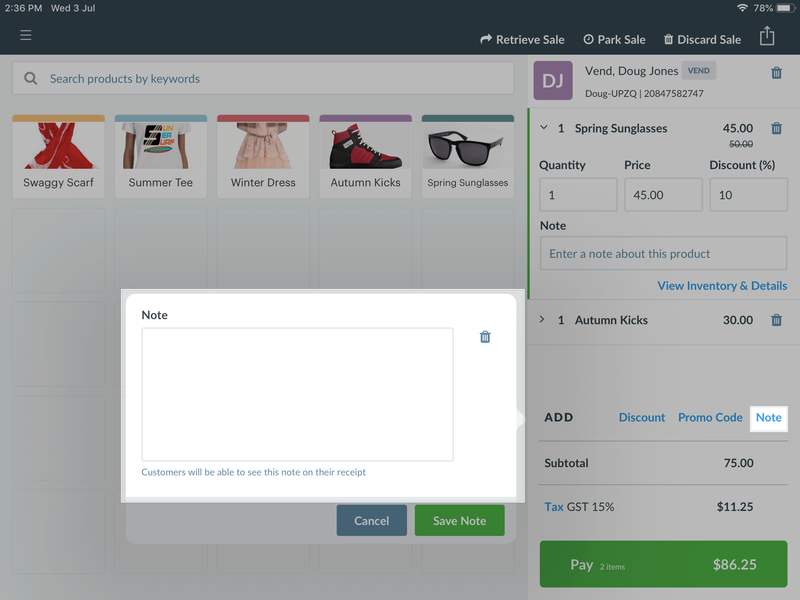 Adding a note about a product - This feature can prove useful when selling customised orders. If a customer wishes to order a burger but holds the mayonnaise, for example, you can make a note of this here. Remove the item from the sale - Tapping the trashcan icon will remove the product from the sale. Increasing or decreasing the item price This option can be used if the system price does not match the price on the label. Add a discount - This can be either a fixed amount (e.g. $2) or a percentage (e.g. 10%). 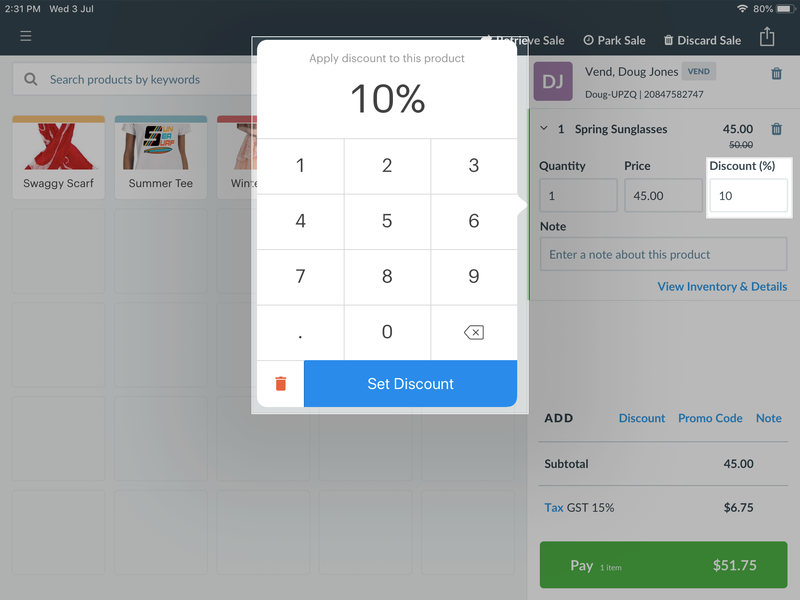 To apply a line-item discount, tap on the item you wish to discount and select Set Discount. If you'd like to apply a fixed amount discount (e.g. 2 dollars off) you can do this by tapping on Price underneath the product name. Tip: It is always good to check that the discount has been applied correctly after this step so that your customer is not over or undercharged. If your store has restricted discounting to managers, you'll need to switch to a manager or admin to apply the discount. To do this, tap the settings icon in the top-left corner of your screen. Click the username/icon. The user-switching window will open. Tap the manager/admin account to log them in. Once the manager/admin has applied the discount, you can switch back to the cashier to complete the sale. There are also several ways you will be able to manage the sale you are processing. For example, special customer pricing, removing tax and discounting the entire sale, adding a customer or note to the sale, and park a sale if required. Vend has built-in functionality that makes it easier for you to run store-wide sales or provide special pricing to customers like VIPs or staff members. This is called Price Books. You'll need to set up your price books in the main web app (check out instructions here). Once your Price Books are set up, they'll automatically apply on Vend for iPad. Just add the product to the sale, and the price will automatically update. If the price is restricted to a particular type of customer, it will not update unless that customer is added to the sale. Like discounts, if the change is a price reduction, you'll see the previous price crossed out, as well as the new price. If you've increased the price (for example, with public holiday surcharges), the old price will not calculate change accurately. Once you've added all your items to the sale, you can also remove all taxes from the sale. To do this, tap on Tax (GST) and turn off the blue enable taxes icon to remove all taxes from the sale. It's also possible to add sale wide discounts. These are often used when you a running a storewide sale. To add a discount to the overall sale, head to the bottom of the sale and tap Add Discount. Choose whether you'd like to issue a $ Discount (e.g. fixed amount discount, i.e. 2 dollars off) or a % Discount (e.g. 10% off) of the sale. In addition to adding a note to a particular product, you can also add a note to the entire sale. To add a note, click the menu arrow in the top right corner. Choose Add sale note. Type the note you want to add to the sale and click Add note. You will also be able to add a sale note to the sale, if needed, once you complete the sale. The note will then appear at the top of the sale. Important: If you have Print note on receipt turned on for this register, you will be notified that this note will be displayed on your customer's receipt. 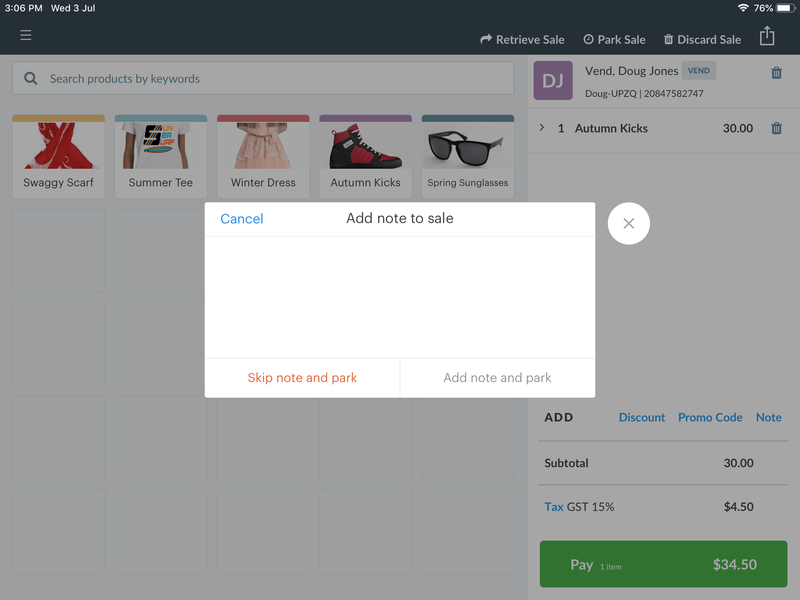 To keep internal sale notes, you will need to head to Setup -> Outlets and Registers -> Edit Register and click No in the Print note on receipt section. To edit or remove this note, tap the note at the top of the sale. Update your text, and click Add note or click Remove note to remove the note from the sale. If you'd like to record the sale you've made against a customer's name, you can add this customer to the sale. If you can't find the customer, you will need to add them to your store as a new customer. To learn how to do this follow these steps. Now that you've located the customer you were after tap their name. This will add the customer to your sale. You'll see their name appear in the line items in the top right corner. If you've picked the wrong customer, search again, and we'll automatically change it to the correct one. At this point, it is a good idea to check the customer's details are correct. To do this, tap on View Customer's Details and this will open a window displaying the customer's basic details. You'll be able to view their name, contact details, and any outstanding balances. This also includes account sales, laybys, and loyalty balances. If any of the information is out of date, click on Edit information, update the information required, and then tap Update to return to the sale. 1. If you've searched for their name, click on the blue 'person' icon to make sure you are searching for a customer. Type in the customer's name, and there will be a Add New Customer option at the bottom of the search list. 2. Otherwise, tap the arrow in the top right-hand corner. Choose Add New Customer. A window will open, where you will be able to add information about the customer. Select group Once you've added the details, click Create. The window will close, and the customer will automatically be added to your customer database and also to the sale. Sometimes, you might need to place a sale on hold. This is called 'parking' a sale. You can do this at any time up until you take payment for the sale. Tip: We recommend adding a customer's name to your parked sale. This makes it easier to locate the sale when you want to continue it. Tap the arrow button in the top right-hand corner. Choose Park Sale. You'll be asked to add a note. Add the note, and click Add note and park. You will also have the option to skip adding a note. If you no longer want to complete the sale, click the menu arrow in the top right-hand corner of the screen and select Void Sale. This will void your sale but will keep a record of it in your sales history. Click the green Pay button which will open the payments window. The Pay button will also state how many items you have added to the sale. You'll notice in the payments window that you can edit the sales total if the customer has tendered less or more. This allows you to calculate change accurately and also enables you to split payments. Splitting payments can come in handy when the customer wishes to pay using more than one payment type (e.g. part cash and part credit), or if they are splitting a bill. For more information on how to take multiple payments, check out this article. Once you have confirmed the amount tendered is correct, you can pick how you wish to process the customer's payment. By default, you will have the choice between cash or credit card, but it is likely that your store manager would have added more. To pay using cash, you can use the Quick Cash payment keys, or type the cash amount into the amount tendered field. The app will tell you the amount of change you need to issue a customer if required. If you are using a cash drawer with your printer (this does not apply to handheld printers), this will cause the cash drawer to open. Sometimes, you may need to open the cash drawer manually. This may be because you have given the customer incorrect change or forgotten to place cash or a cheque in the cash drawer. This will close the sale. If you have gift cards enabled, and the customer wishes to purchase using a gift card, you can process the sale by clicking Pay and tapping the Gift Card payment type. For more information on how this redemption process works, check out this article here. If you have not yet set it up, log into the Vend app and add a credit card payment type. Once you've set up the payment type, a Credit Card button will appear on the payment screen. Click this button, and the sale will close. 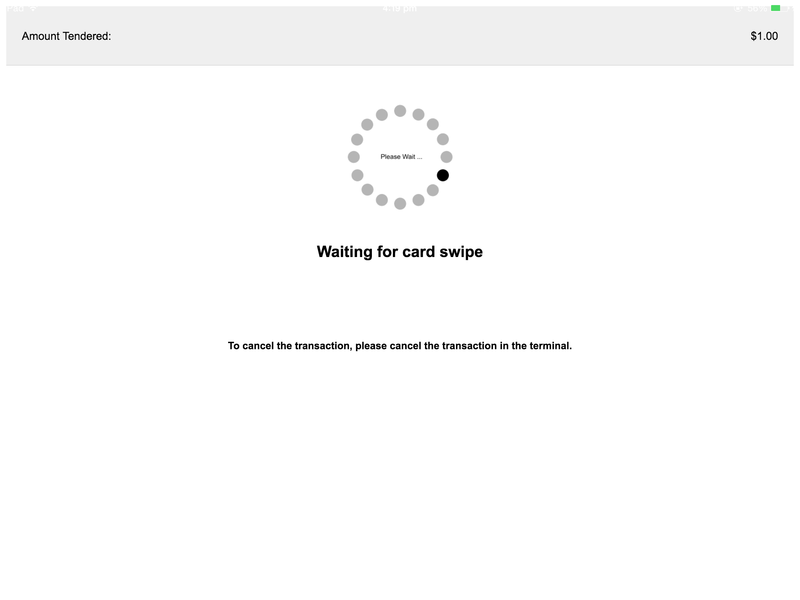 You'll need to process the payment in your card terminal manually. Smartpay provides an integrated card payment terminal for New Zealand retailers. Read more here about connecting the terminal. Once your terminal is connected, you'll be able to take payments. Important: If your Internet connection is unavailable, you will NOT be able to process payments using Smartpay. The customer then enters their account type and PIN number (or, for credit cards, bypass PIN to sign the receipt). If accepted, the payment window in Vend will close. If declined, you'll be returned to the payment screen to choose another payment type. Can I process a card-not-present transaction? Tap the Smartpay button. This will open a payment screen. Instead of swiping the card, start typing the customer's card number into the SmartPay terminal. Follow the prompts on your Smartpay terminal screen. Select 'Single Moto' when the options appear. What happens if the register cannot connect to my terminal? Try to process the payment again. Try and make a sale using the Smartpay payment type again. If you are still unable to make a payment, you'll need to take payment using another payment method, such as cash or cheque. iZettle provide an integrated card terminal for retailers in the UK and some European and Central/South American countries. iZettle payments are not available offline. The minimum payment amount for iZettle payments is 1.00 unit of your currency, e.g. £1.00. On the payment screen, confirm the amount you wish to pay. Click the iZettle payment button. The customer will need to enter their PIN into the terminal. Once the transaction is approved, the sale will close. If the transaction declines, you will be returned to the payment screen. You should try the transaction again, in case it was a connection issue. For more help on iZettle payments, visit their help site. Having trouble connecting your terminal? Check out the iZettle help guide. Make sure you've set up PayPal payments and your blue or black PayPal dongle is plugged in. Click the PayPal payment button. The customer will need to sign the screen if the transaction is more than $50. Confirm the customer's signature is correct. What do I do if the customer's card does not read? You can try unplugging the card reader and plugging it back in again, and the reattempting swiping the customer's card. Otherwise, you can manually enter the customer's card number by clicking the Manually Enter Card link - this appears on all the PayPal payment screens. Click the Worldpay payment button. Vend will show 'Waiting for card swipe', and the payment terminal will show the amount to pay. The customer will need to swipe, tap, or insert their card. If the transaction is over $25, the customer will need to sign their receipt. If the transaction declines (or the payment is only for part of the balance), you will be returned to the payment screen. Click the Tyro payment button. Vend will show 'Swipe/Insert Card' and the purchase amount. You (or your customer) will need to swipe/insert the card. The customer then needs to enter their PIN number or sign the receipt. If the customer signs, you will need to approve their signature. The payment will not send to the terminal! This sometimes happens if you open a different register on the same iPad - Terminals are paired with a register in Vend, not the physical iPad hardware. You'll need to repair the items. This happens when you've set the receipts to print to your terminal when your terminal does not support receipt printing. Check your settings for printing receipts. 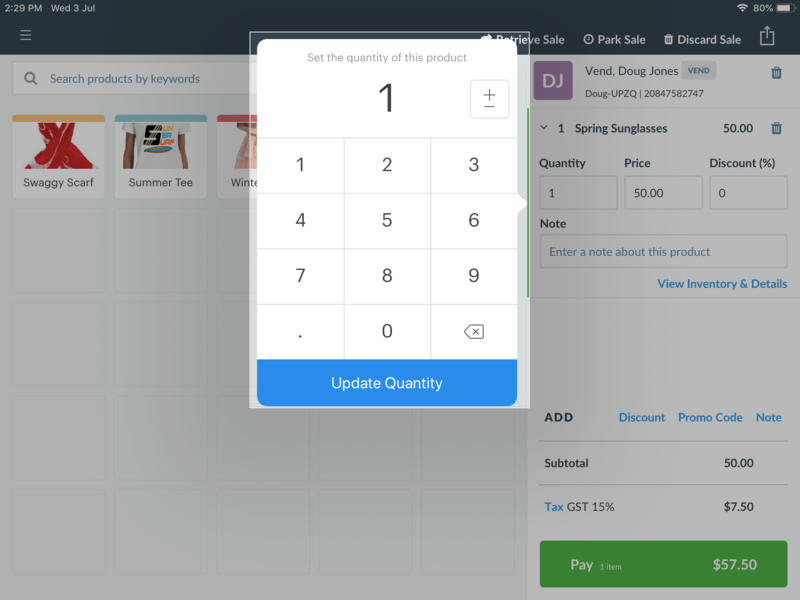 If you are using Vend's loyalty program, customers can use their earned loyalty amounts to pay for all or part of a sale. Make sure you have added the customer to the sale. If you've made an error, you can click remove last payment in the top left-hand corner of the sale complete screen. This will reverse the loyalty payment. 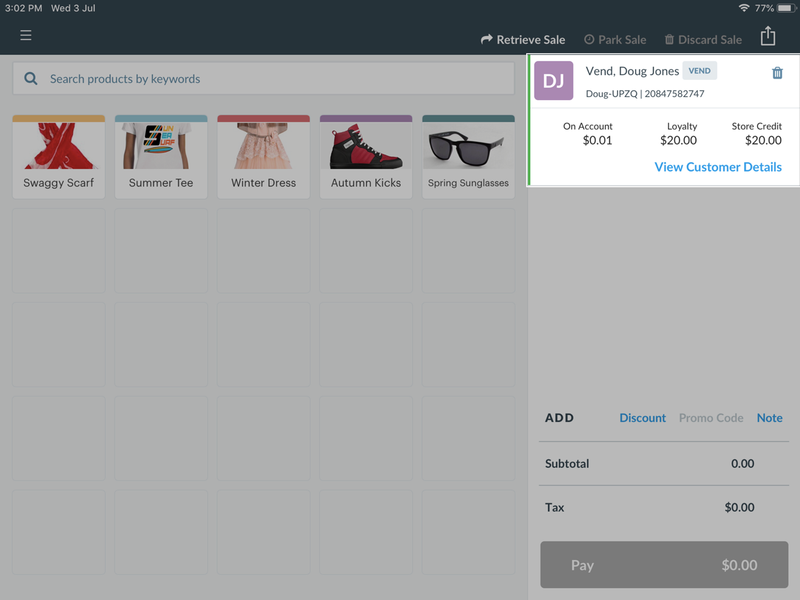 Using Vend on iPad, you can place sales On Account for your customers. What are on account sales? On Account, sales are used to track product purchases that the customer intends to pay off at a later date. Check with your manager to make sure your store offers On Account sales to every customer, or if approval is required. Each On Account sale is a separate invoice the customer will need to pay. If you'd like to add a sale to an existing invoice, you'll need to find and open this On Account sale again. Do not do this if your store uses the Xero integration. If your store has note prompting turned on, you may be asked to leave a note now. Opening an On Account sale: To open an On Account sale tap the menu button in the top left of the screen and open up the Sales History. Tap the On Account sale. Choose the Open Sale button. The sale will open on your sell screen. What are Layby/Layaway sales? A Layby/Layaway is a sale that allows you to take a deposit from a customer for a product, set that product aside, and let the customer pay it off at a later date. Make sure you follow your store policy about deposits and layby terms and conditions. It is important when performing laybys that the item is set aside and tagged with the customer's information to avoid it being accidentally resold. In the payment window, type the amount the customer is paying for their deposit and choose the applicable payment type. Then, tap the Layby button to put the remaining balance on layby. Tip: Don't forget to give the customer a copy of your store's terms and conditions if required. Opening a Layby sale: To open a layby sale tap the menu button in the top left of the screen and open up the Sales History. Choose the *Open Sale button. The sale will open on your Sell Screen. Once you have chosen your payment type, you will be brought through to the sale confirmation screen. If automatic receipt printing has been enabled for your store, a receipt will now be printed. If automatic receipt printing is turned off, you'll see the option to print a receipt now. 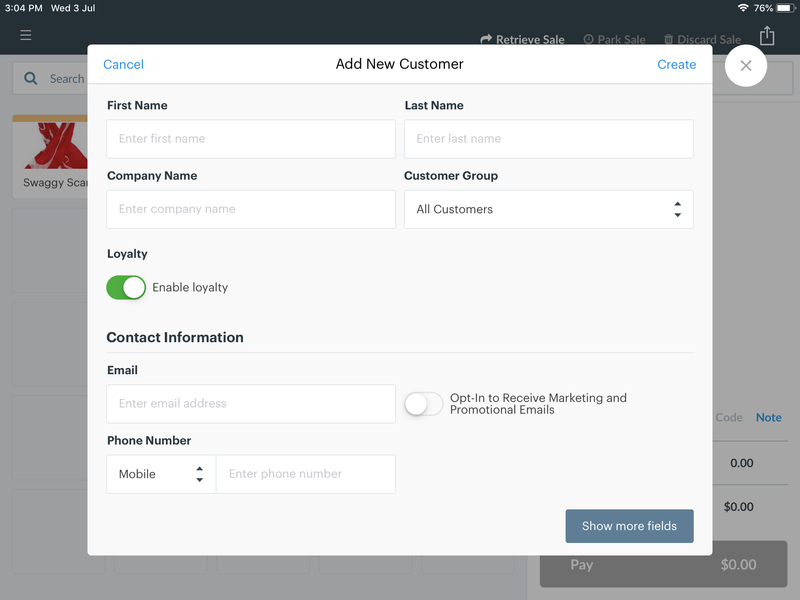 You'll also have the option to add a customer directly to your database and email a receipt to the customer. If you've made a mistake with this sale, you can tap the Undo Last Cash Payment button in the top left-hand corner to return to the payment options. On the sale confirmation screen, you will also have the option to add a sale note about the sale you just processed. Once you finish, if you have not been automatically returned to the sell screen, you can tap Next Sale. Once you finish, if you have not been automatically returned to the sell screen, you can tap 'new sale' in the top right-hand corner. By default, the sale confirmation screen automatically closes 10 seconds after the sale has finished. You can adjust the period the window stays open for in the app settings. From the sell screen, tap the menu icon in the top left corner, and choose Settings, then General Settings. Turn off automatic closing entirely. Extend or shorten the automatic closing period. You can have between 2s and 2 minutes. On this screen, you can also choose whether you would like to disable the email receipt option. 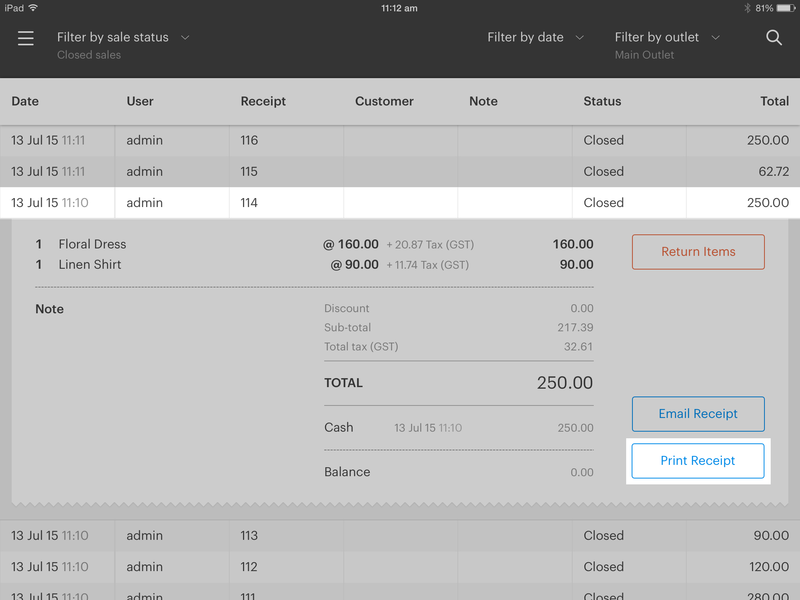 In your sales history, you can view previous sales, load an open sale onto the Sell Screen, and reprint receipts. Tap the menu button, on the left-hand side of your screen, to open up the side navigation menu. Important: If your iPad is offline, Vend for iPad will only show you parked sales in other registers made before you went offline. You will also be able to see any sales parked on this iPad since you went offline. Search: Tap the magnifying glass, and type customer name, receipt number, or staff member name. Note: If you've got filters active, the customer and user search will only return sales from within that period/outlet/status. This does not apply to receipts. Date: Tap Filter by date and choose a day, month, or year to refine your results. 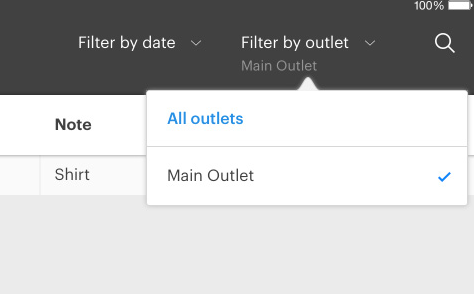 Outlet: Tap Outlet and choose which (or all) of your outlets to broaden your search. Once you have found the sale you require, tap on it to see more details. Tap on the sale required. Important: You cannot park a sale in Vend for iPad once a payment has been applied. retrieve a sale if there has been a payment applied. 1. Tap the menu button on the top left of the screen and select Sales History. 2. Click on the sale you'd like to reprint, this will expand the sale and show more details. Looking for an older sale? 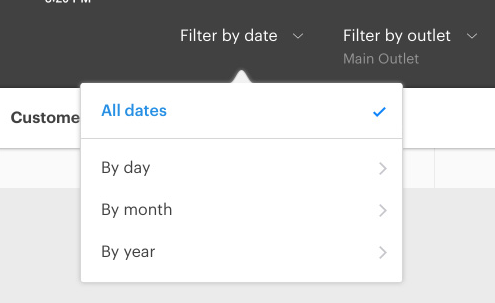 Try to filter by date or use the magnifying glass on the top right to search for a sale by a customer, user or receipt number. Returns are, by default, turned off for cashiers, but you may be able to process them if your store manager has enabled the cashier returns function. If you can process returns check out some of these important 'need to knows' below. It is important to note that you may only complete a return on fully paid sales (including fully paid account and layaway sales) and not on an open on account or layaway sale OR existing return transaction. Tip: Different retail stores have different rules about what items can and cannot be returned, so it is useful to check in with your supervisor about this before processing any returns. Ask the customer for their receipt (if required under policy) or for their name and date/time of the sale or other details required to find the transaction. Tap on the menu button on the top left and open Sales History. Use the filter options to search by receipt number (or other details) if required. Once the sale is located, tap on it to expand the details. Check the item being returned to ensure it matches the item sold. Next, click on the Return Item button. This will load the customer's sale will into the sell screen. The item(s) in this sale should now all be on the sell screen they'll show as negative amounts. If it is a multi-item sale, the customer may only wish to return one of the items. If this is the case, tap on the trashcan icon next to any products the customer does not want to return. Once you are happy with how it looks, tap the red Refund button. Does your customer wants to exchange their item for something else? : No problem! Add any products the customer wishes to exchange to the sell screen, then tap the green Exchange button. If your sale does not already have a customer attached, you'll be asked to record the customer's details. This step is not compulsory, but it is a very good idea to record these if you can. Once you've recorded your customer's details, the payment window will open. Choose the cash, credit card, or cheque payment option. The smart-cash amounts will be disabled. This will close the sale. You'll need to issue the customer their refund. To refund via Smartpay, click the Smartpay button. You'll need to enter your Merchant PIN into the terminal. Then, swipe the customer's card. Integrated returns are not yet available for iZettle. We recommend using cash refunds until then. PayPal refunds must be processed via your PayPal account. You can only refund the full amount of the transaction, and the original transaction in Vend must also be voided to return the sold items to your inventory. We suggest cash refunds as an alternative method. If your store has Vend's Cash Management feature enabled, you can use it to add a cash float the beginning of the day and add and remove petty cash. If you are in charge of opening the register for the day, you'll be given the option to add a cash float. To do this, add your desired cash float amount under the 'opening float' section. At this stage, you may also want to add a note to provide further detail about the float. This can be useful if you need to make a note of something for your store manager, but they are not in the store yet. Once you are happy with everything, physically add your float to your cash drawer and click set opening float. Important: Every store has their rules and practices around cash handling. It is best to check with your store manager first that they allow cashier users to add and remove cash. Throughout your day, you may need to add or remove cash from the cash drawer. To add or remove cash, open the side navigation menu and tap 'Cash Management'. Here you will see the option to add cash, remove cash, or view any cash movement activity. Tip: It is always good to add a note for you or your store manager's reference when using any of the cash management features below. Cash out: You can use this option to track any cash you remove from your cash drawer. Cash out can be used to track actions such as safe drops, where you may need to remove cash from your drawer during the day for safekeeping. Petty cash out: Sometimes you might need to take money out of the cash drawer for store expenses such as cleaning products or stationary. Using the petty cash out option will allow you to keep a record of this. Cash in: Cash in allows you to track any additional money you put into your cash drawer. This is used to increase your float amount during the day if required. Petty cash in: Select this option if you need to put some of the petty cash you've taken out, back into the cash drawer. If you take out more petty cash than you spend, you may be left with some change. You can put this change back into your cash drawer using the 'petty cash in' option. Sometimes, you may need to open the cash drawer. This may be because you have given the customer incorrect change or forgotten to place cash or a cheque in the cash drawer. Cashiers are unable to open the cash drawer - a manager or admin must open the cash drawer for you. Managers and administrators: Ensure you are the user currently logged in. Tap the arrow menu in the top right-hand corner, and select Open cash drawer. This option will only appear if you have the cash drawer enabled in your settings. Vend on iPad downloads a copy of your products to your iPad so that it is faster to use, and so you can make sales in case you disconnect from the Internet. Sometimes, when you make changes to your products, especially if you have been trading offline, you might need to download a new copy of them. Normally, this happens automatically, but you can do it manually by tapping the menu button and tapping the Online status. You can then view the current status and choose Sync Register Data. This page also tells you if anything in your store is currently syncing. You can customise the following settings in Vend on your Mac or PC. Whether cashiers can discount a sale. More info here. Check out the 'Making Sales' section to learn how to discount a sale. Always require passwords, no matter which user you are switching to. This is the MOST secure option. How do these settings work? 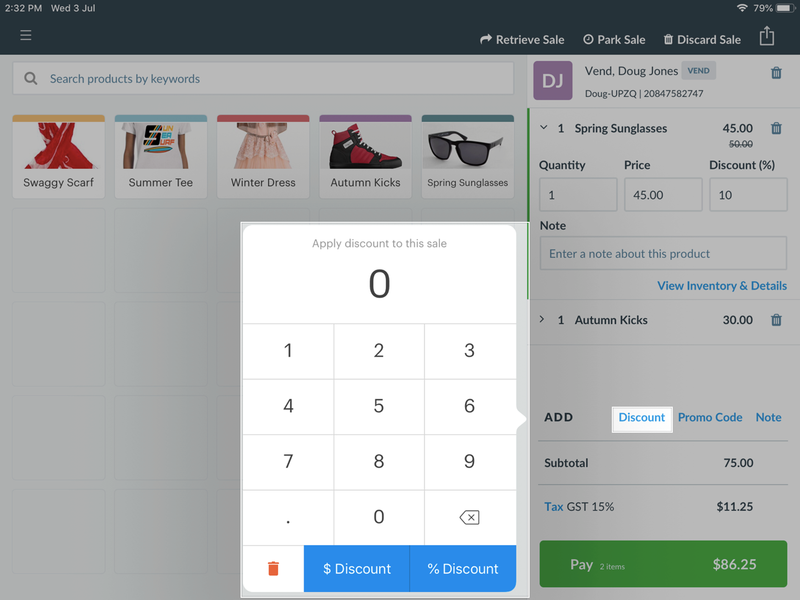 Once enabled, end-of-sale user prompting will open a window at the end of every sale. This window shows you which users are currently logged in and which are logged out. Logged out users will be greyed out. The window only shows users who have been granted permission to access the outlet you are logged into. The users will be listed in alphabetical order. The current user is highlighted on the left. To switch to another user, tap the name or icon. If you have password restrictions turned on, you'll now be asked to enter the password. At the end of a shift, cashiers should log out. You'll need to switch to the user you want to log out, then click the menu button, and click the user's name (at the bottom of the screen). Then, click the logout button. At the end of the day, you can also choose to close your store, which will log out all users. Complete this to close off the transactions for the day and record your payment totals. Click the top left icon, then choose Close Register. 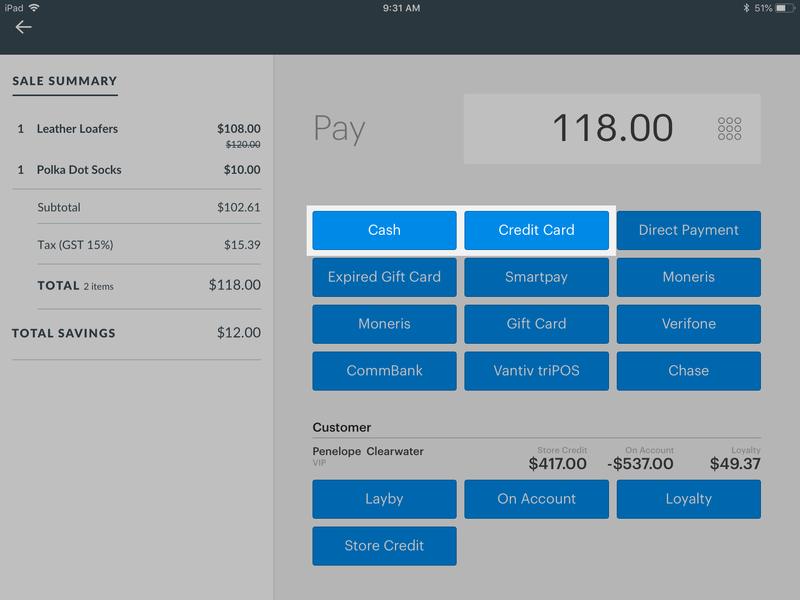 Vend on iPad will display each payment type and the amount expected. If your closing totals are different to those the app has calculated (e.g. cash is up or down on expected) you can overwrite the totals here. To close the register, please click the button to Close Register. This will mark the register as closed and save any sales & payments from the session. 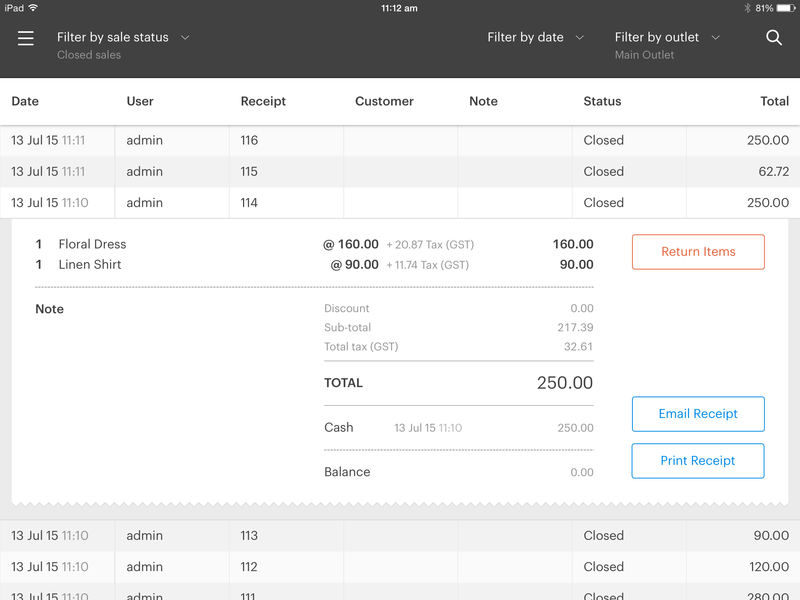 If you are using the Xero integration, your register closure data will be posted to Xero. Important: If a cashier closes your register, the closure data will not automatically be sent. A store manager or admin will need to send this by accessing the Register Closure report and clicking the post to Xero button. Once you've closed your register, you can choose to print a copy of the register closure report, which outlines sales and payment totals for the day. This can be useful to include in your cash count bag, for example. 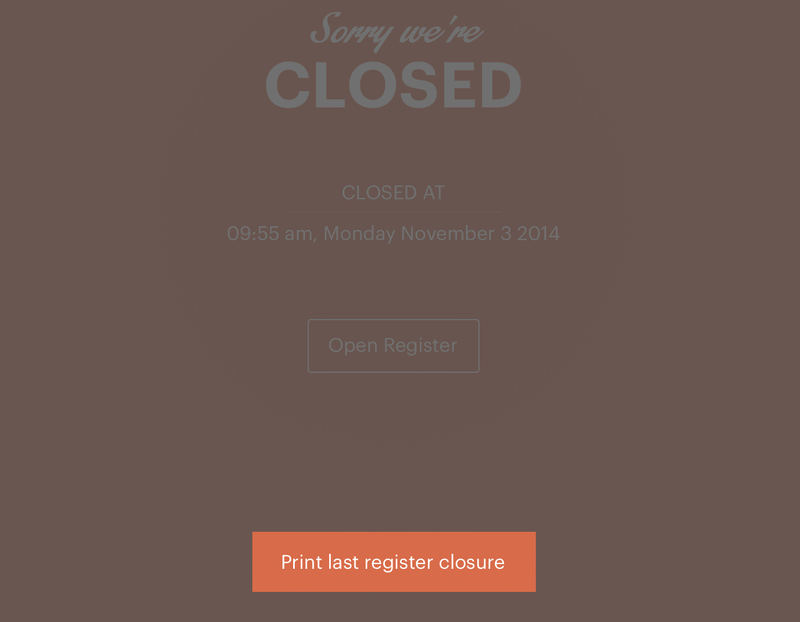 Once your register is closed, tap Print last register closure on the register closure screen. This will print from your standard receipt printer. You'll be able to reprint this until you next close your register. Just tap the menu icon to open the side navigation menu, and choose the Register Closure menu option. The Print last register closure option is at the bottom of the page. This is an extra option which ensures all users are logged out at the end of the day. You must close your register before exiting your store. To access this, tap the menu icon. The side navigation menu will open. Choose the Settings menu and select Exit Store. All users will be logged out of this iPad's Vend account, and you will be returned to the log in screen. Tap the username at the bottom of the menu. Select Log out, then close the store. Next time you log in, you'll need to open your register before you can start making sales. After you've completed the normal login (enter username and password, select register), you'll be taken to the sell screen. If the selected register is not open, the right-hand Sales panel will advise you that you need to open the register. Click the Open Register button, and confirm that you want to open your register. Currently, Vend on iPad can process sales offline. Vend will store the sales, and synchronise them when you are back online.